Large-flowered Trillium, Trillium grandiflorum, is a plant that is often seen as a mass of plants carpeting the woodland floor. The current Blue Jay Barrens population now consists of eight plants; 1 blooming, 1 with a developing flower bud and 6 non-flowering. This may appear to be a dismally small population, but it’s twice the number of plants I counted ten years ago. At this rate, there ought to be a carpet of blooms in about 60 years. The trilliums grow on one of the steep slopes I discussed before. The steepness protected the slopes from many abusive activities and now discourages browsing deer from feeding here. This is one of the newer members of the group. 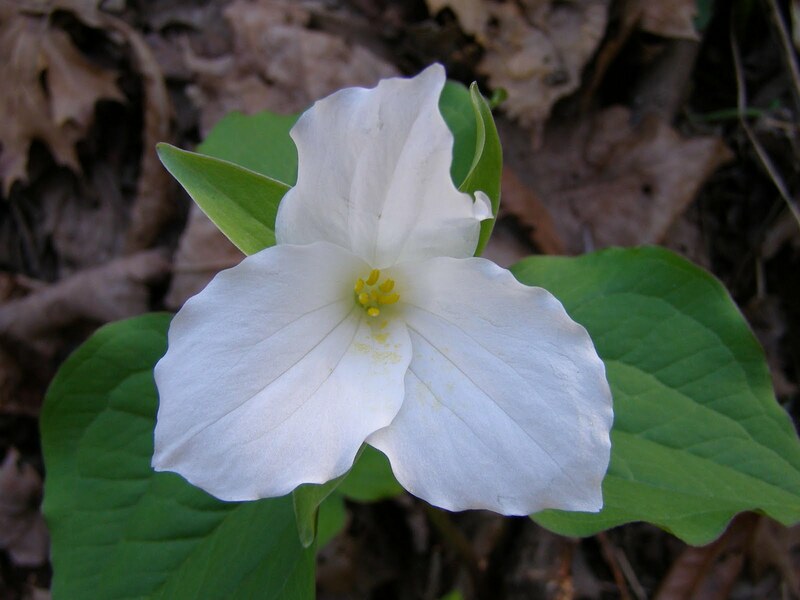 Large-flowered Trilliums have to grow for several years before flowering, so it takes a long time to build up a population. It’s also a plant that is slow to spread to new areas, because it depends on ants to scatter the seeds. A juicy morsel is attached to the seed that causes the ants to carry the seed back to the colony. After the ants finish their meal, the seed is carried out and discarded. This practice of ants dispersing seeds is fairly common among woodland flowers. Fifteen years ago, I was attracted to this spot by a single white bloom from a trillium growing here. This hillside is near a frequently walked trail and the fact that I had never seen the bloom before makes me think that this was a young plant with its first flower. That single plant has now grown to be this group of three. Only one will be blooming this year. If the flower can produce mature pollen before the other bloom fades, I’ll bring out my pollination brush and make sure the plants share their pollen load. I’m trying to do all I can to ensure a good crop of seeds. This plant should soon be old enough to start blooming. In another couple of years, I should begin seeing five or six blooms each spring. That won’t quite make a carpet, but I’m sure my imagination can fill in the gaps. This is Juniper Sedge, Carex juniperorum, one of the Ohio rarities that does well at Blue Jay Barrens. It’s one of those inconspicuous plants that most dismiss as a grass. Many people avoid studying the sedges, saying that they are too difficult to identify. I think people are put off because most of the sedges don’t have big showy blooms and you often need magnification to clearly see the identifying characteristics. I admit that it’s sometimes difficult to decipher the descriptions in the texts, but several species run through the keys quite nicely. When I’m having trouble with sedge identification, I like to think about Juniper Sedge. This plant was overlooked or misidentified by botanists for decades before it was recognized as a new species a mere 20 years ago. If the professionals can have trouble, I can be allowed to have trouble. Those swollen masses are the perigynia, each of which contains a nut like seed. The short stalk coming up from the center of the mass held the male parts of the flower. Perigynium shape and features are important in properly identifying many sedges. A 10X magnifier certainly comes in handy for looking at the tiny details. This is a typical landscape for Juniper Sedge. Look for these plants where there is shallow limestone soil. Eastern Red Cedar, a type of juniper, is normally common on these sites and was the source of the common name for this plant. Here’s a shot of the bloom at its prime. Not a showy flower, but it efficiently accomplishes the job of seed production. The plant produces an abundance of seeds that are easy to germinate. Juniper Sedge is low growing and not particularly noticeable. If not confined by surrounding vegetation, the growth radiates from a central core. This makes the plant look as though it had been mashed beneath someone’s shoe. Plants in crowded conditions or growing up through dead grass stalks have their leaves held more upright. These last few shots are to help with Tom Arbour’s efforts to get people to appreciate the sedges. He has photographically demonstrated their beauty and I have to agree that we do have some lovely sedges. A hands-and-knees posture is usually required in order to gain a full appreciation of this group of plants. Many types of sedge would be perfect additions to a perennial flower bed. I’ve used a few around the house and they are very attractive, as well as being practically maintenance free. I would love to have a sedge lawn. There are many sedges that would limit their leafy growth to ten inches or less and make a really lovely ground cover. I do have a couple of prairie areas here that are dominated by Hirsute Sedge, Carex complanata, so I know that growing a solid stand of sedges is possible on dry sites. The noticeable part of the sedge flower is the cluster of stamens from the male flowers. The female flowers are usually not very noticeable. In this sedge, the female flowers are located between the leaf and the base of the male flower stalk. Looks sort of like a bug got squashed in there with a couple little legs left sticking out. Squawroot, Conopholis americana, is an odd plant that has the look of something struggling to stay alive. The photo shows it in full bloom and despite the pale coloration, this is a plant in peak condition. My first encounter with this plant left me wondering just what kind of oddity I had found. The flower spikes emerge from the ground looking like malformed pine cones. Squawroot is like the person that never seems to fit in. 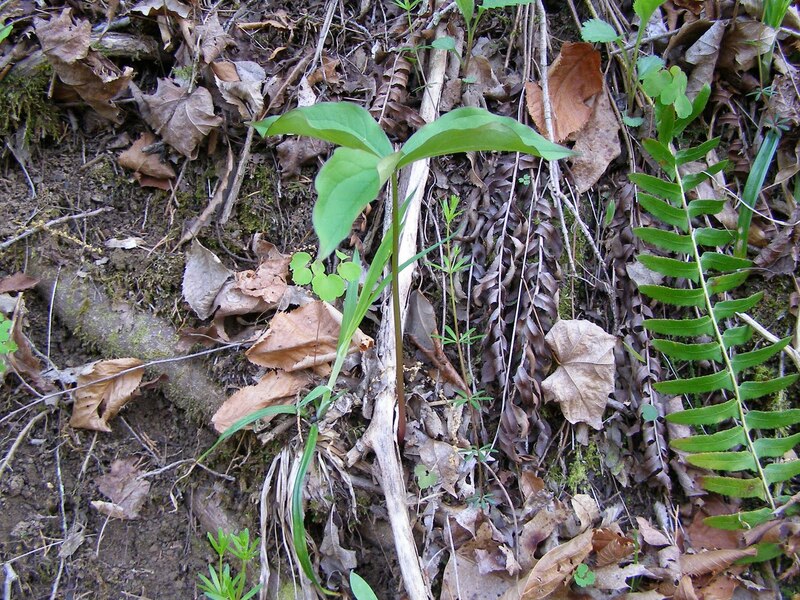 In the middle of a woods full of enchanting and delicate spring flowers, you have this brute of a spike pushing through the leaves, displaying its unhealthy looking browns and pale yellows. It’s not hard to see why some hikers give it a wide berth, as though afraid of contracting whatever disease has ravaged the plant. The flower buds are hidden behind rough looking scales. The emerging flowers push themselves up over the lip of the scale. 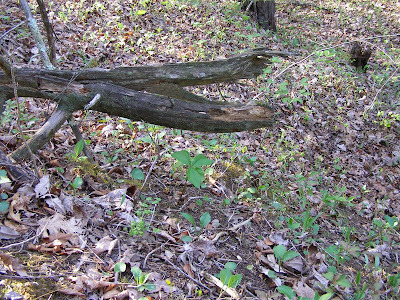 Squawroot is parasitic on oak trees. The bulk of the plant is underground where it bonds with the roots of the tree. It’s one of those odd plants that lacks chlorophyll and takes all of its energy from the host. I’m always encouraged by plants like this since a healthy parasite population is normally indicative of healthy hosts. Squawroots often form large clusters of flower stalks. I’ve never seen any flying insects around these plants, so I don’t know what the pollinator might be. 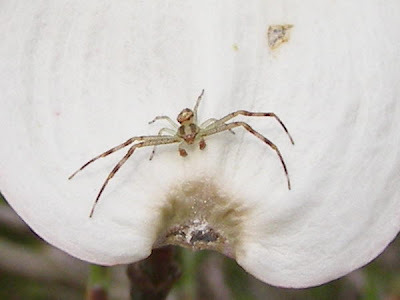 Crab spiders often hide on the flowers indicting that there must be some insect that visits. It’s possible that it is visited by some species of moth or other night flying insect. Maybe I should design a trap that can be put over the flowers to collect any insect visitors. I’ll add that to my ever growing list of things to do. Here’s a beetle that will really catch your eye. Most often encountered on hiking trails in open woods, this Tiger Beetle, Cicindela sexguttata, glows in the sunlight like a miniature Christmas tree light. When disturbed, it runs or flies a short way down the path. This has got to be the most recognized of the various Tiger Beetle species. I found this beetle on a trail in the middle of the field. Instead of running or flying, it tried to hide beneath plant leaves. It hid like a child, burying its head and leaving its rear end sticking out. A little prodding got it to come out where I could get a few shots. I wonder if he was the original model for bug eyes. He certainly looks like the bug eyed monsters from the early horror movies. Eyes like this are a necessity for a predatory species such as the Tiger Beetle. The Tiger Beetle hunts other insects and is quite accomplished at the task. It is also hunted itself by other predatory species. The bubble eyes give it a 360 degree view of its surroundings, so it can watch for predators as well as prey. I love this guy’s jaws. A matched pair of sharp sickle like mandibles are used to grab and hold prey. The mandibles are so long they have to be folded across each other when closed. Once captured, I doubt any small insect could break the Tiger Beetle’s strong hold. Spring is the time of year to see this species. The adults are busy mating and laying eggs and will all be dead by mid summer. Hatching larvae create burrows in the ground in which they will live for one or more years before emerging as adults. If you should encounter this species while out walking, take some time to get a close look. It’s well worth the effort. If I were to choose a single group of organisms for intense study, it could easily be the flies. Flies are a group with an immense diversity of species that interact with an almost infinite number of plants, animals and habitats. These first couple species are Tachinid Flies, a family of flies that spend their larval period as an insect parasite. The Tachinid family represents a large selection of flies that may differ greatly in size, shape and color. It may be that all the photos in this post are Tachinids, but I’m not sure of that. 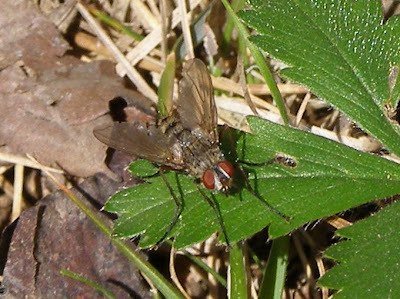 Many Tachinid Flies display very pronounced abdominal bristles. If I were a frog, I don’t know that I would want to sling my tongue onto something like this. The pattern on the rear of the fly may look like a faded slow moving vehicle sign, but these guys can be quite speedy. Finding that the direct approach easily spooked the flies, I adopted the willow in the wind stalking method and swayed my way into range. Witnesses to my photographic methods might be convinced that the beer cans slung along the roadway had actually come from me. Gray striped jacked and bulging red eyes attracted my attention here. I got the impression that this tiny Dracula was trying its best to hypnotize me. This reminds me of a type of fly that I helped raise in school while I was volunteering in the insect rearing lab, but that fly had a gray eye color and could fill a 30 gallon trash can with several pounds of wriggly maggots. Another set of large red eyes, this time set in a white face. The willowy legs and shape of the face remind me of a butterfly. The legs look like the type that would be very useful in sneaking up to lay eggs on some suspicious insect host. This individual is displaying some long abdominal spines. Makes me wonder if this is also one of the varied shapes of the Tachinids. I’ll be spending more time this year watching the flies. Let me know if you have any recommendations of good fly identification guides. I began working on dragonfly identification last summer. My strategy is to get shots of every dragonfly I see. I then sit with the computer image before me and my reference books to the side and try to match the image to the descriptions. Dragonflies are a wonderful group to study. They are beautiful creatures, their habits and life histories are fascinating and best of all, you can get references and identification guides that allow you to identify the adult form of every species you are likely to see in your area. This Blue Corporal was my first encounter of the year. The Blue Corporal is one of several species where the males change colors as they mature. This is the coloration of pattern or the female or the young male. Considered an uncommon species in Ohio, there is speculation that it is one of those species that is expanding its range northward. I found them everywhere in the prairies and barrens. The shadows on the rock make it appear that this individual has an extra set of wings. This species spent a lot of time perching on the ground and never moved very far when disturbed. That describes the behavior of most of the dragonflies I’ve identified so far. I’ve seen many other interesting species, but they seem to spend all of their time in the air and I can’t get a picture. I think of antiques when I see this species. The browns give the appearance of age and the abdomen looks as if it was of a special wood carefully carved, painted and preserved. This is the Springtime Darner, a common species that may be able to utilize the Blue Jay Barrens creek during their aquatic phase. Lack of reliable surface water here is a definite limiting factor for successful dragonfly reproduction. Wing venation is one of the important characteristics that allows you to be certain of your identification. Fortunately, in the majority of species it’s fairly easy to see the veins in photographs. It can still get confusing. In this individual the venation indicates that it should be a female, but the restriction in the abdomen is indicative of a male. Well, I’m satisfied for now just to be able to figure out the species. Flowering Dogwood, Cornus florida, has put on a wonderful show this spring. The tree’s horizontal branching pattern produces layers of flower rafts. The white bracts surrounding the flower clusters glow in the sunlight. From below, you can see the reddish-brown spot at the tip of each bract. The flowers are found at the base of the four white bracts. Some of the flowers have not yet opened, while others have been pollinated and are beginning to develop fruit. The native bees are busily pollinating the flowers. I have yet to spend any time identifying the various bees found at Blue Jay Barrens. I’m at that point where I can imagine thousands of species of bees, because I see thousands of bees and can’t identify more than a couple of them. With most groups of organisms, a little bit of study allows you to identify many of the common species or genera. Then your whole perspective changes as you are suddenly able to sort a mass of individuals into a few species or types. I’m fortunate that my lack of knowledge of so many things will provide me with unending opportunities to experience the joys of learning. The dogwood has a simple leaf, but there is often great beauty in the simple things. The neat lines and graceful curves of the new leaves are just as attractive as the flowers. Most of the Flowering Dogwoods at Blue Jay Barrens are found in the open fields, growing in the low pH shale soils. Twenty-five years ago, they were common understory trees in the woods. About 20 years ago the trees succumbed to Anthracnose Leaf Blight caused by the fungus Discula destructiva. The trees in cool shaded areas were most susceptible to the disease and were completely destroyed. A few small trees survived in fencerows and there were sprouts beginning in the fields. We went many years without any dogwood blooms. I began a policy of allowing Flowering Dogwoods to stay in the fields where they seem to be less susceptible to the disease. I’m looking forward to the day when they reach a size that approaches those that were lost. It appears that Crab Spiders are going to be plentiful this year. I’ve been seeing many types in the different flowers. These are the larvae of the Eastern Tent Caterpillar, Malacosoma americanum. It’s a type of moth, so you ought to be calling it the Eastern Tent Caterpillar Moth. That means the larvae in the picture could be referred to as the Eastern Tent Caterpillar Moth caterpillars. It could get sort of confusing. It’s a very pretty creature, but that’s not why caterpillar is so prominently featured in the name. 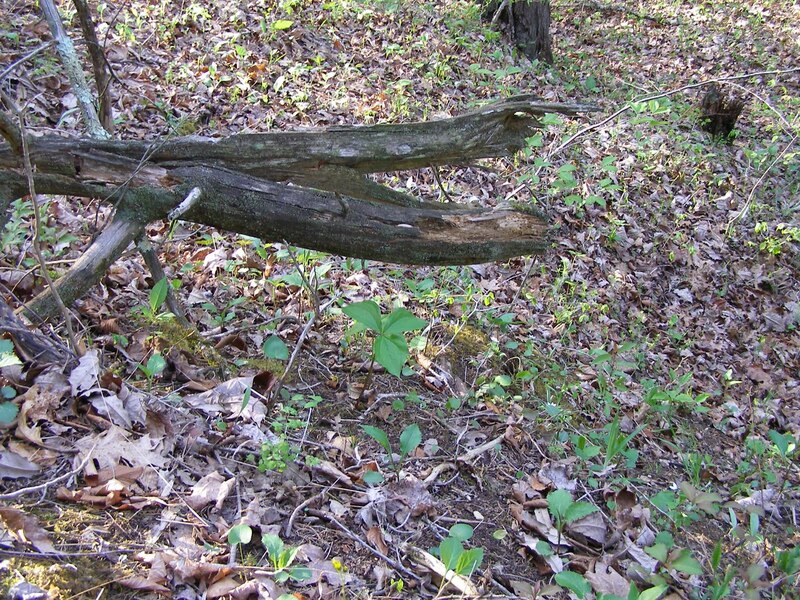 What draws attention is this structure, most often seen in Wild Black Cherry or related species. This webbed fortress is created cooperatively by the group of caterpillars as a refuge and protection against predation and the elements. Predators would have to penetrate many layers of webbing in order to make contact with the caterpillars. There don’t seem to be many birds or predatory wasps that are up to the challenge. The caterpillar nest stands out like a flag in the tree. The sight of this web mass can instantly trigger formation of a lynch mob of suburban dwellers ready to protect their homes and families from the evil menace. The incidents I witnessed as a child, always seemed to follow a standard sequence that reminded me of the way the villagers went after the Frankenstein monster. People would gather with their monster fighting tools; most conspicuous of which were gasoline and fire, two items guaranteed to produce a super lawn party. The branch containing the offending nest would be cut from the tree and drug into the open lawn, where the nest was soaked in flammable liquids and set ablaze. It was really fun when the property owner was absent and returned home later to find evidence of the service his neighbors had performed. Additional web layers are added to the nest as the caterpillars grow. The inside of the nest becomes quite dirty with accumulated frass (caterpillar poop) and shed skins. The caterpillars leave the nest to feed on the tree leaves and then return to the nest. This is what outrages the typical homeowner. A single nest may contain several hundred individuals that can completely strip all the leaves from a medium sized tree. During feeding is when the caterpillars are most vulnerable to predation and many can be lost at this time. Here are some signs of caterpillar feeding. Fortunately, the caterpillars hatch in early spring and are ready to pupate in four to six weeks. This means that a tree denuded by Tent Caterpillars has time to grow new leaves and is not terribly hurt by the experience. When populations are high, Tent Caterpillars often travel as a group in search in a new food source. Masses of marching Tent Caterpillars also get a response from most suburbanites. I’m unable to watch Cloggers perform without thinking of a community Tent Caterpillar stomping. Golden Ragwort, Senecio aurea, has been conspicuous as basal leaves through the entire winter. Now it has produced a tall stalk topped by a cluster of yellow flowers. Ragworts produce the typical composite type flower with a central cluster of simplified disk flowers and an outer border or showy ray flowers. The Golden Ragwort flower head is small and requires close examination to pick out the intricate details. Golden Ragwort is primarily a plant of the field where they can blanket the landscape with a mass of yellow blooms. Unfortunately, Golden Ragwort is often confused with some of the annual weedy mustards that cover disturbed ground like that found in crop fields. People are likely to brand this plant an undesirable weed just because they have never bothered to give it a close examination. This is a perennial plant that can remain green through any season. Most of the leaves occur at the base of the plant, so loss of the flower stalk does no harm to the plant. As the season progresses, summer flowers and tall grasses will hide the ragworts. It won’t be until the following winter that the green of the basal leaves again catches the eye. The Golden Ragwort leaf has lobes on either side of the stem attachment that give it a heart shaped appearance. The very similar Round-leaf Golden Ragwort has leaves that taper down to the stem attachment. Both of these species are common at Blue Jay Barrens, but they seldom occur together in the same location. The flowers remain attractive for many weeks as new buds develop and open. The stems and unopened buds have a soft pubescence that gives them a cobwebby appearance. This seems to wear off as the plant ages. As far as I know, this Plume Moth doesn’t have any specific ties to Golden Ragwort. I just think this is a really neat moth and since it landed beside me as I was taking shots of the flowers, I took its picture and stuck it in here for those people who really prefer animals over plants.